Here at CMS Themefactory we’re always looking for a way to bring the best theme experience to our customers. That’s exactly why we originally began by developing genre-targeted, industry-specific premium WordPress themes. Some people are happy to build out their website from scratch, with nothing but a generic shell to start with. But here at CMSTF we aim to provide themes that are basically pre-formatted websites. All that’s required for our customers is to customize those premium, industry-specific themes with their own content, logo, etc. Doing it this way makes the process of launching a new WordPress website simpler and a whole lot quicker. In our continuing efforts to provide the best user experience, we’re now developing WP themes that run on the popular and highly regarded Genesis theme framework. This “nuts and bolts” framework is like a super-powered chasis running on top of the WordPress core engine - providing a lightweight, SEO-friendly, responsive and flexible customer experience. Our premium themes are run on top of this super-powered back-end, providing the ultimate customer experience. The first batch of our Genesis framework themes has just launched in our WordPress counseling themes category. This series of new themes is titled “Counsella” and comes in a variety of color combinations, some light and neutral-toned, others featuring deeper hues. Each of these premium Genesis framework counseling themes allow you to develop and launch an impacting, professional therapist site in very short order. As mentioned earlier, these new therapist themes are 3/4 towards finished sites. 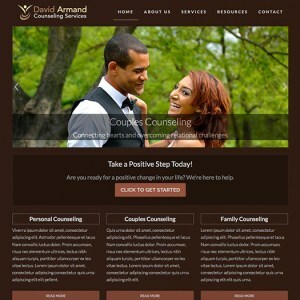 We’ve used our expertise in building hundreds of industry-specific websites over the last decade to construct a layout and design scheme that best suits the targeted goals of a counselor’s website. This includes, for instance, a prominent “call to action” button on the homepage, right under the slideshow, designed to allow potential customers to quickly and effortlessly take action and book a counseling appointment. In addition, we’ve also created a sample layout, with page titles already built it, that provides the skeleton for your fully fleshed out therapist site. This includes a service-specific submenu and pages for frequently asked questions. Also featured is a blog, or “resource articles” section, that will serve to let you continue to add relevant content to your site overtime, which will of course aid your search engine rankings. We’ve even included a resource section with sample intake forms. As with all of our premium themes, these Genesis framework WordPress counseling themes include all of the images you see featured in our live demos. These are images we have full in-house rights to, and you have rights to use on your counselor websites. As with all other aspects of these themes, the images we use are hand-chosen for their relevance to therapy field. So if you, or someone you know, is in the market for a new WordPress counseling website, we hope you’ll take a moment to peruse through our fresh collection of Genesis framework counselor themes. It’s our goal that these new layout designs will allow customers to launch truly world-class, easy to use, easy to manage, professionally inspiring therapy websites.